Welcome to another post in the brilliant series by MikaelinhoFM. 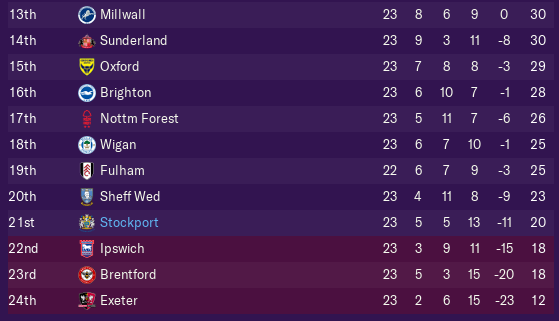 In the previous post, we saw his Stockport side finish their League One season in style – to find out exactly how they did, follow the link below! “At least you tried, guys” Manager Marcus Allbäck heard how bad it sounded but after their sixth straight loss he felt that he had ran out of words. Loyal servant Frank Mulhern looked like he was gonna start crying. Marcus started thinking of something comforting to say as the locker room door suddenly swung open. In came Angry Tony Pulis, looking more savage than ever before. The redness of his face was deeper than the colour of a stop sign and it actually looked like smoke was coming out of his ears. “What the f*** is this?” he screamed at the frightened players. “You are all awful! Even the true men I brought to the club have been awful! YES! I’m looking at you, Yann Songo’o!” he continued before he threw a chair that missed Frank Mulhern by an inch and then ran out of the dressing room again. The players looked at each other but no-one spoke, not even Marcus Allbäck. They all felt that Angry Tony Pulis was right. The simple truth was that the team had been caught flat-footed. The players just didn’t look good enough and pretty much none of them had any experience of football at this level. So this is what the Championship feels like, Marcus Allbäck thought to himself. Getting crushed week in and week out…No, it cannot be that easy, he thought. We need to turn this around. He got up from his seat and started following the echoes of angry shouts in search for his angry technical director. They needed to formulate a plan! Together with Technical Director Angry Tony Pulis manager Marcus Allbäck identified three major problems. The goalkeeper, the right back and the current tactical system. Let’s face it. Ben Hinchliffe is not a Championship quality goalkeeper. At least not at age 33, if he ever was. After six straight losses and loads of conceded goals it became painfully obvious to Allbäck/Pulis as well. The solution is George Long. He is an upgrade to Hinchliffe in every aspect. Well-rounded technically, decent mentals (at least better than Hinchliffe) and a much stronger physical presence both because of better physical attributes and an extra 10cm height. He will most certainly provide much-needed stability at the back. It cannot have come as a total surprise that the right back position was lacking in quality, since the club hadn’t managed to sign a single one during off-season. You might get away with using central midfielders or right-wingers in League One, but certainly not in the Championship. Here, no permanent solution could be made, since the club didn’t have any transfer funds left and the players available as free agents were not even close to Championship quality. Instead, Ashley Richards comes in as a loan from Luton. Ok all over the board with a solid base of mental and physical attributes. He likes to run with the ball down the right and can do it fairly well as well (Dribbling 10). He is also a decent crosser of the ball (10). Defensively he is by far the best option with Marking 14, Tackling 13 and Positioning 14. A real bargain, just a shame that it’s not a permanent deal. Finally, and maybe most importantly, the team weren’t at all producing the style of football wanted by Marcus Allbäck and obviously it wasn’t producing any results either. Defending low just invited plenty of chances and set pieces and hoofing the ball way simply meant that it came back even faster. Angry Tony Pulis was adamant in his demands to keep the Sexi Brexi foundation though, which meant that a return of the Marcus Allbäck’s Bielsa inspired tactic from earlier wasn’t to think of. Instead the two masterminds managed to fuse their ideologies into the monster you behold below. 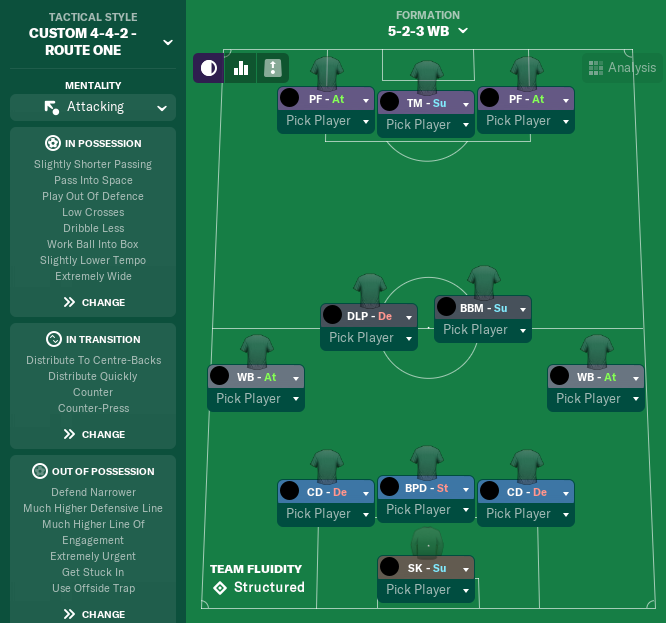 While keeping the 5-3-2 formation the idea is now to defend as far away from their own goal as possible. While keeping the frantic pressing game from earlier hopes are to win the ball much closer to the opposition’s goal. And by winning the ball closer to goal there is no point in hoofing the ball, is there? Instead, a more short-passing approach will be tried, at least initially. Without changing the player roles too much this will probably suit the current players pretty good. You might have already figured out that it was a tough pre-season transfer window for manager Marcus Allbäck. With a pretty much non-existent transfer budget and the smallest wage budget out of all the Championship clubs options were few. To give you an example of the differences between top and bottom – Danny Drinkwater of Brighton alone has a weekly salary of €83K, which is 60% of the total Stockport wage budget. Early on Marcus targeted Ryan Tunnicliffe as his no 1 target, but in the end he chose Scottish Premier League club Aberdeen. His no 2 target Herbie Kane chose Stockport however and looks to add a bit of quality to the club. A Manchester United Academy graduate with the mental attributes as his strongest area. He is an aggressive, hard-working central midfielder with a nice passing ability. He also displays physicals good enough to get the job done. A really nice addition to a central midfield that needed this type of player. From: German Bundesliga side Borussia Dortmund for 165K. Jaques Songo’o is the player with the best Angry Pulis base rating. With this rating system the team appears to be lacking a bit of quality up front, which in reality is quite unlikely considering the fact that duo Wright and Mulhern have been the team’s best players for the last couple of seasons. 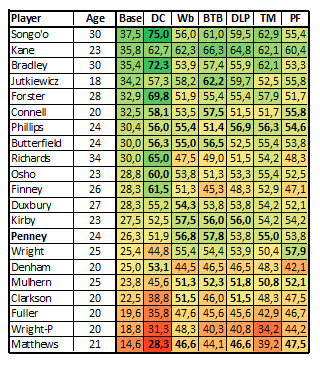 With an emphasis on defensively important skills the players with the highest base ratings are also rated highly as central defenders, like Songo’o, Bradley and Forster. So it’s most likely down to the defensively focused rating. After an awful start the team actually picked up a bit of form, climbing out of the relegation zone in the last game before the winter break. Even though things are looking quite grim, the trend has been rather positive, making the chances of staying up rather decent!